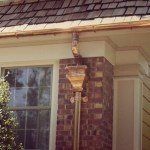 Your home is your biggest investment, so why not incorporate gutter accessories that not only protect but also enhance the character and value of it? At GlennStone Roofing and Gutters, we offer a wide variety of unique gutter accessories. Are you looking to give your home an extra finishing touch? Our embossed gutters incorporate a visually interesting pattern. Embossing the gutter gives it added strength and makes your home unique. Embossed gutters add value and character to your home and give your home a beautiful exterior crown molding. Also known as conductor heads, our leader heads enhance the beauty and architectural style of any building. They are traditionally installed under the soffit. Besides being ornamental, conductor heads also perform a number of functions. By letting air into the line, they help water drain faster and with less noise. They also allow the combining of several downspouts into one larger one. Leader heads act as a cleanout point for debris and an overflow point for water. 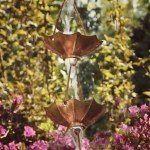 Rain chains are a beautiful and functional alternative to traditional closed downspouts. They break the fall of the water, guiding it visibly downward to the ground, into a basin or even a rain barrel for storage. Rain chains sound great and make a terrific and elegant outdoor accessory. 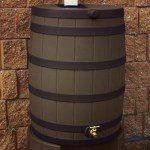 Decorative rain barrels can be an attractive addition to your home – and saving rain is beneficial for the environment. Rain barrels help ease stormwater overflow problems, decrease demand on municipal water, and help prevent rain from becoming polluted stormwater. Rain itself does not contain chemicals added by the city system or leaching from old pipes; rather, it is naturally soft, oxygenated, and pH-neutral. By properly self-managing stormwater on your property, you help to mimic nature and reduce stormwater’s damaging effects. Bubbler pots are underground downspouts that keep the rain from your gutters away from your foundation. Proper water management around your home’s foundation helps keep the water from reaching your basement. Water free-falls into a debris filter and flows underground, away from your home. As water fills up in the bubbler pot, the lid raises up to let water evenly flow over onto your lawn. Drainage slots in the bubbler pot let standing water filter down into the ground. 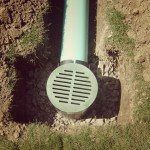 The solid drain cover will then drop down and seal out grass clippings and dirt. GlennStone Roofing and Gutters installs the best seamless gutters and the latest gutter accessories to provide you with beautiful, unique, and stylish gutters that have as much personality as your home. 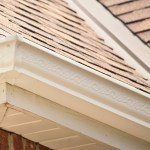 Choose from a wide variety of styled and patterned gutter accessories that will boost your home’s curb appeal and add a personal touch to your home’s exterior. Request a quote today.